Gardens in London commonly suffer from the continuous growth of plant material on paths, patios and decking. Due to their smaller size and density, residential gardens in London get lower than average direct sunlight and little wind. Mosses and algae grow easily in these wetter, more sheltered conditions. Algae, moss and other plant matter can make walkways really slippery. It’s a good idea to keep your paths and decking clean to prevent accidents. We usually find that annual pressure washing done thoroughly is adequate. Aspect is fully trade accredited and is a member of The Guild of Master Craftsmen. When you book Aspect to do your pressure washing you can count on getting the professional help you’re looking for. Don’t think that pressure washing is only for decking and patios. Almost every hard surface in your garden that’s exposed to moisture is at some point likely to benefit from a pressure wash. Depending on how well they’re protected from the weather, things such as wooden furniture, can benefit from an annual clean. When most people think about cleaning their wood decking their first thought of equipment is a high-pressure washer. Unfortunately, cleaning wood decking isn’t as quick and simple as just connecting one up and powering your way through it. The reality is that by not following the proper processes you could end up doing significant damage to the wood. The majority of the cleaning work should be done using a specialist chemical product. A suitable set of brushes and a fair amount of physical effort is generally needed. 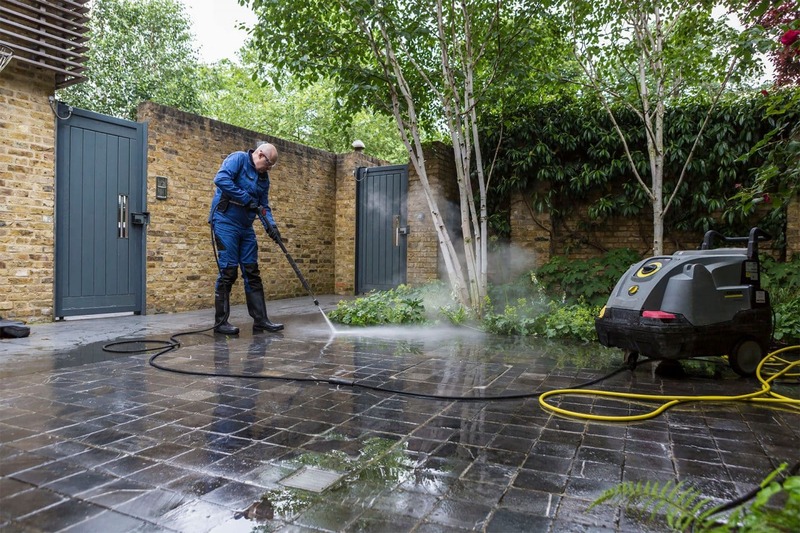 Once the chosen cleaning product has been applied correctly a pressure washer can be used. The pressure should be set high enough to remove both the chemical solution and surface dirt, but not so high that fibers of the wood become raised. Selecting the right pressure, the correct nozzle, the ideal angle and using an appropriate and consistent technique are all important considerations in getting the best results. Customers have occasionally asked us “Can roof tiles be cleaned with a pressure washer?” – we don’t recommend it. The water pressure can delaminate the surface of the tile and could erode the tile itself. Although you might have a cleaner roof at the end, you could also have exposed it to faster weathering and reduced the lifespan of it. You might even damage the roof itself which could cause leaks. If you have patches of moss growing on your roof it should ideally be removed. If it isn’t it can help to erode tiles, however, it can also end up in gutters and downpipes causing blockages. The best way of removing moss from roofs is with a stiff brush and a moss and algae inhibitor. An Aspect roofer can be booked to access your roof safely for this work.